Students after SPM, O-Levels, UEC, STPM or A-Levels interested in Architecture should be prepared for a long road ahead to achieve the status of obtaining the title “Ar.” as a professional architect. After completing the Foundation or Pre-University programme students will need to go for the degree programme that’s accredited by the Lembaga Arkitek Malaysia. The BSc (Hons) Architecture at UCSI University is accredited by Lembaga Arkitek Malaysia (LAM) equivalent to LAM Part 1. UCSI University is the best for architecture in Malaysia having won many awards in this area. Architecture is a combination of creativity, history, sciences, and design. You will learn how to conceptualise and design buildings in relation to the economic, technical, environmental and social needs. Architecture strongly relates to built environment and urban planning disciplines such as civil and structural engineering, quantity surveying, and property economics and management. If you are interested in creating things, buildings and spaces, technology, art and design, a career in architecture may be for you. Architecture is the art of designing the human built environment. Buildings are one of the most visible productions of man, and vary greatly in design, function, and construction implementation across the globe. The vision that Architects conceive is projected onto the society and the built environment in which they practice. These conceptions and ideas will inadvertently have profound effects on the built environment, and consequently on the people who interact with that environment. Architecture is, therefore, an art form, the learning of which requires professional practice, personal artistic development and technical knowledge of building. The constant dialogue between society and the architect is what produces architecture – as a product and as well as a discipline. Architecture is an art form – the learning of which requires professional practice, personal artistic development and technical knowledge of a building. The constant dialogue between society and the architect is what produces architecture – as a product and as a discipline. The School of Architecture and Built Environment understands that all those who study and work in the ﬁeld of architecture need a framework for aesthetics and a functional appreciation for buildings and context. This can only be achieved via a thorough grounding in the design process, building sciences and technologies allied to an understanding of the important social, cultural, artistic, and historical factors which inﬂuence architecture. This philosophy underpins every teaching and research programme delivered at the School. The architecture programme develops both academic understanding and practical skills required for careers in the professional ﬁeld. Graduates will be equipped for careers in the broad ﬁeld of design in the built environment sector. UCSI University is the best for architecture in Malaysia seeing the number of awards that their students have won. All of UCSI University’s Architecture & Interior Architecture degree programmes comply with the latest requirements for accreditation by the Council of Architectural Accreditation & Education Malaysia (CAAEM), Lembaga Arkitek Malaysia (LAM). At the 2014 Persatuan Arkitek Malaysia -Tan Sri Ar Chan Sau Lai Architecture Award prize-giving ceremony today, Kuala Lumpur Mayor Datuk Seri Ahmad Phesal Talib said that the current ratio of architects in Malaysia is one to 17,257 people. There is a shortage of architects in Malaysia due to the low passing rate in the final test which would enable them to become professional architects, which carries the title of Ar. After chatting with EduSpiral online, I then met up with them at the university for a campus tour that helped me make a great decision about my future course. Currently, UCSI University has more than 1,000 employer organisations registered as heir Co-Op employers. With the number rising annually, these partnerships create job opportunities for students to be job-ready upon their graduation. 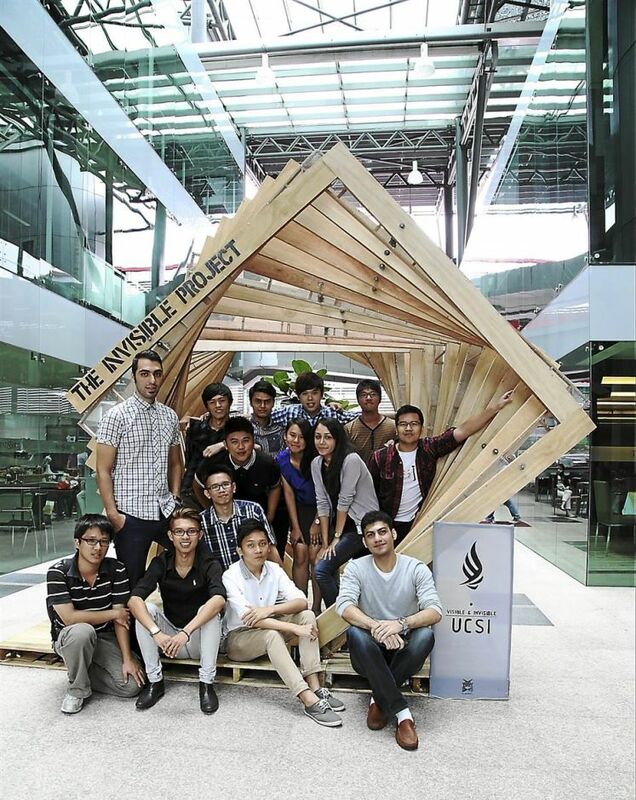 Students interested in studying architecture can do so at UCSI University with their accredited programme. School leavers, especially Sijil Pelajaran Malaysia (SPM) holders from Sarawak can begin their first step to obtain a degree in architecture by enrolling in UCSI’s Foundation Studies in Arts or Science at UCSI’s Kuching campus. Students after SPM or O-Levels can also join the main campus at Cheras, Kuala Lumpur will for the Foundation program for one year. The minimum requirement to enrol for the foundation studies is five credits in the SPM examination. The students will then go through the foundation studies at UCSI University Sarawak Campus before they can enter the School of Architecture and Build Environment to pursue an architecture degree at UCSI University’s state-of-the-art campus in Kuala Lumpur. Upon successful completion, they will then enter into the degree for another 3 years at UCSI University which is accredited by Lembaga Arkitek Malaysia (LAM) equivalent to LAM Part 1. The next step is to go into an accredited Masters equivalent to LAM Part 2 for another 2 years. Graduates will then work for 2 years and then sit for the LAM Part 3 exams and then to finally become an architect. The whole process after SPM will take you about 8 years. Malaysia is known as Lembaga Akitek Negara (LAM). They govern the entire profession starting from the definition of an architect under the Malaysian Constitution, licensing, practice, acts and enactments as well as education. The other body that concerns the well being of architects themselves is Pertubuhan Akitek Malaysia. It functions as an association that takes care of its members, organize functions and manages the professional development of an architect from the lowest to highest qualification. Just like Bar exams for lawyers, architects also require certain level of qualification that is a standard worldwide. The qualifications are known as LAM Part 1, 2 and 3. The equivalent of this is RIBA (Royal Institute of British Architects), AIA (American Institute of Architects) and RAIA (Royal Australian Institute of Architects). The diagram above shows the career path of an architect. After graduating with Part 2, a person is known as an architect, and will be able to practice according to the job specification of an architect. This should be the minimum target of anyone pursuing this profession. Anything less is a waste of time. Obtaining a fully accredited degree (or equivalent) that carries Part 1 or 2 equivalent. Sitting for individual exams after obtaining a non-accredited degree for Part or 2. Part 3 can only be obtained after practicing as an architect for a minimum of 2 years and fulfilling all the project requirements set by LAM. Fulfilling these needs, the architect will then submit themselves to a series of interviews and exams to determine that they are capable and absolutely qualified. These exams are conducted by Persatuan Arkitek Malaysia (PAM). The architecture degree in UCSI University is accredited by the Council of Architectural Education Malaysia (CAEM) which is run by Lembaga Arkitek Malaysia (LAM). Architecture is a mixture of practical and theoretical studies. It is important to understand the philosophy, history and culture in order to create stunning buildings. Architecture students will learn how to use design software to create models, drawings, prototypes and structures. You will learn how to use creative and rational inquiry to analyse and provide solutions to design problems, integrating emerging aesthetic, technical, social and ethical concerns. Architecture students in Malaysia will apply advanced digital design tools to solve design problems and address sustainability issues. Students will spend long hours in research and project-based architectural design subjects to create aesthetically beautiful design pieces that are sustainable and environmentally friendly. To create these projects will require you to think logically on how the buildings function and are constructed, and then combine them with innovative & creative concepts. Petrochemical Laboratory, Physiology & Pharmacology Laboratory, Molecular Biology Laboratory, and Microbiology Laboratory, fashion design workshops, Psychology Laboratory, as well as drafting and design studios.